Protesting South African Revenue Service (SARS) officials at the Beit Bridge port of entry outside Musina in Limpopo believe the protest action at the border impacted negatively on revenue collection in the country. All employees withdrew their services and only managers are manning service desks. Striking workers are demanding an 11% salary increase nationwide. The queues of vehicles that had formed in the morning have now subsided. Workers union – Nehawu spokesperson at Beit Bridge Katlego Seseani says they will continue with their protest. “ Operations are not running normally, the trucks that you are seeing here this is not normal, Beitbridge is normally a very active border that the movement of trucks wouldn’t be what you are seeing here today, export and import is highly affected. The people that are helping inside we hear is management that is working , management or SARS are working , we don’t know how long they are planning to do this because the workers are here outside. We are asking something simple 11.4%, can the employer give it to us please? Another union, Public Servants Association of South Africa (PSA) shop steward Moshieni Montsha says they are ready to protest until their demands are met. In Western Cape, Nehawu members say Thursday’s strike action has been a success as they have managed to close several branch offices in the province including the main branch in the Cape Town CBD. “One thing that we are here for is to make know through the withdrawal of our labour that we are indeed not happy on the offer that is being put forward by the employers on the table and the failure of them to accede to the demands that we have addressed with them,” says Nehawu Provincial Secretary, Eric Kweleta. 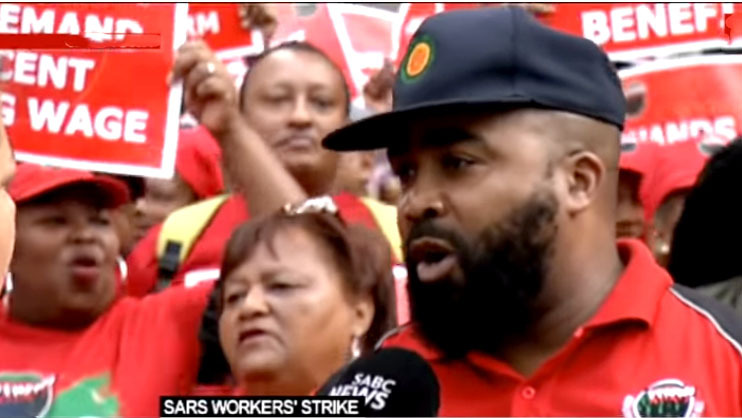 The post Unions in Sars strike aim to protest until their demands are met appeared first on SABC News – Breaking news, special reports, world, business, sport coverage of all South African current events. Africa's news leader..